Regular readers might remember me using this payoff matrix without justification. The big upside is that it lets us look at games by plotting them in two dimensions; I do this in the intro of [Kaz2010]. What makes a game qualitatively “different” is the possible orderings of and compared to each other and 0 and 1. There are 12 possible orderings, and hence 12 different types of games. I label some of them with names. Of course, some regions have multiple names for example the Stag Hunt game. On wikipedia it is defined the same way as game 5 in my figure, but in some settings it is defined to include both regions 1 and 5. Also, I don’t remember why I called game 4 as Battle of the Sexes since that game is usually only studied in the asymmetric case. This game has 3 distinct regions depending on if , , . For a total of 17 distinct games. Challenge for the reader: give a descriptive name to every game and give an example of it in the ‘real’ world! [Kaz2010] Artem Kaznatcheev. Robustness of ethnocentrism to changes in inter-personal interactions. Complex Adaptive Systems – AAAI Fall Symposium, 2010. This post shows some preliminary results for probabilistic strategies in Hammond and Axelrod [HA06a, HA06b] style simulations. I wrote the code and collected the data in May of 2008 while working in Tom’s lab. The core of the simulations is the same as the original H&A simulations. 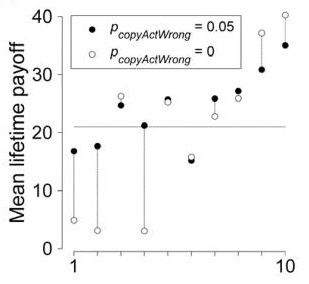 They key difference is that instead of having in-group (igs) or out-group (ogs) strategies that are either 0 (defect) or 1 (cooperate), we now allow probabilistic values p in the range of 0 to 1 where an agent cooperated with probability p. Also, we look at both Prisoner’s dilemma (PD) and the Hawk-Dove (HD) game. For the game matrix, we considered the standard R,S,T,P parametrization. Where R is the reward for mutual cooperation, S is the suckers payoff for cooperating with a defector, T is the temptation to defect for defection against a cooperator, and P is the punishment for mutual defection. For the HD game we had (R,S,T,P) = (0.02, 0.00, 0.03, x) and for PD we had (0.02, x, 0.03, 0.00) where x is the value listed in the parameters section in the table of results. A further stressor was added to some of the PD simulations, and is listed in the comments section. Here we varied the number of tags as the simulation went on. A comment of the form ‘XT(+/-)YT(at/per)Zep’ means that we start the simulation with X tags, and increase (+) or decrease (-) the number of tags available to new immigrants by Y tags at (at) the Z-th epoch or at every multiple (per) of Z epochs. This was to study how sensitive our results were to stress induced by new tags. The results for each case are averages from 10 worlds. The videos show 2 bar graphs the left one shows the number of agents with an igs strategy in a given range, and the right does the same for ogs strategy. Note that the y-axis varies between videos, so be careful! The red error bars are standard error from averaging the 10 worlds. The horizontal green line corresponds to 1/10th of the total world population, and the dotted green lines are the error bars for the green line. This line is present so that it is easy to notice world saturation. The videos start at epoch 1 and goes through all the epochs in the simulations (the current epoch number is tracked by the number ontop). Each frame shows the strategy distributions from that epoch. For me, the biggest conclusion of this study was that there was nothing inherently interesting in modifying the H&A model with probabilistic tags. 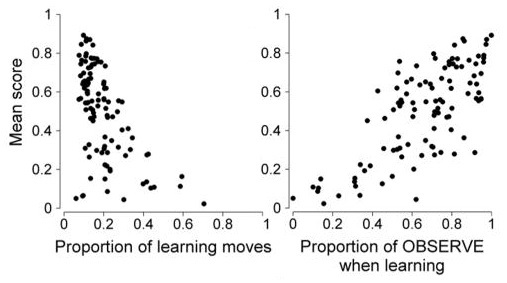 The popular wisdom is that evolutionary models that are inspired in some way by replicator dynamics (this one would be, with extra spatial constraints, and finite population) do not benefit from adding randomized strategies directly. Instead we can let the probabilistic population distribution of deterministic agents allow for the ‘randomness’. However, we will see next week that this popular wisdom is not always the case: it is possible to construct potentially interesting models based around the issue of randomized vs. deterministic strategies. I do enjoy this way of visualizing results, even-though it is completely unwieldy for print. It confirms previous results [SHH08] on the early competition between ethnocentric and humanitarian agents, by showing that the out-group strategy really doesn’t matter until after word saturation [SHK09] (around epoch 350 in the videos) since it remains uniformly distributed until then. The extra stress conditions of increasing or decreasing the number of tags were a new feature and I am not clear on how it can be used to gain further insights. Similar ideas can be used to study founder effect, but apart from that I would be interested in hearing your ideas on how such stresses can provide us with new insights. 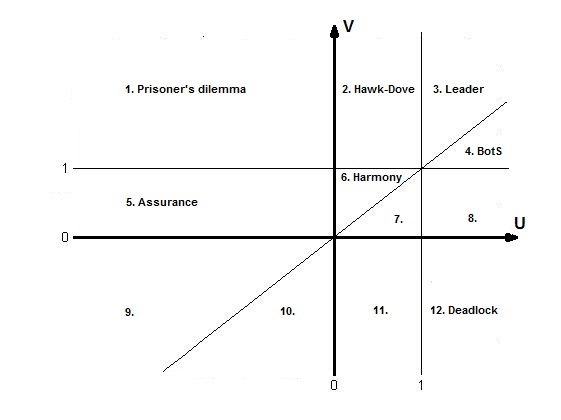 The feature I was most excited about when I did these experiments was addressing both the Hawk-Dove and the Prisoner’s Dilemma. However, since then I have conducted much more systematic examinations of this in the standard H&A model [K10]. [HA06b] Hammond, R.A. & Axelrod, R. (2006) “The evolution of ethnocentrism,” Journal of Conflict Resolution 50, 926-936. 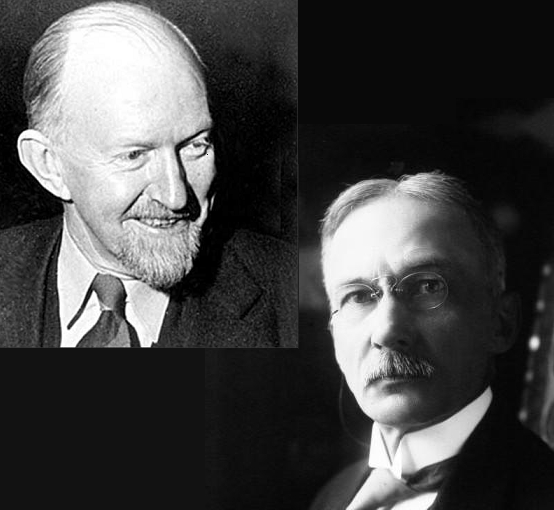 [SHH08] Shultz, T.R., Hartshorn, M. & Hammond R.A. (2008) “Stages in the evolution of ethnocentrism,” Proceedings of the 30th annual conference of the cognitive science society. [SHK09] Shultz, T.R., Hartshorn, M. & Kaznatcheev, A. (2009) “Why is ethnocentrism more common than humanitarianism?” Proceedings of the 31st annual conference of the cognitive science society.